This will be my first game with Bernard Harris, fellow SAGA enthusiast. 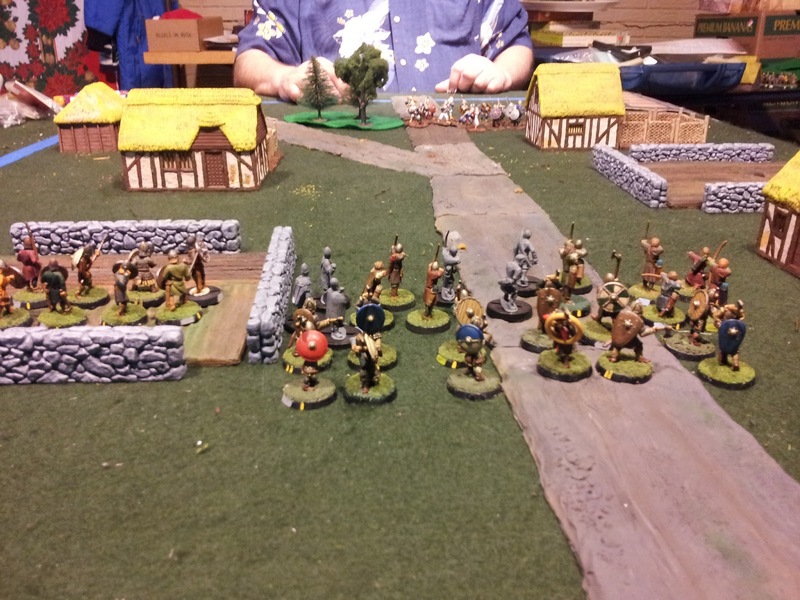 Vikings set up on the left, Normans on the right, Normans move first. The hill is a flat topped hill, meaning that missile armed units must be on top to target units, unless the units are on the edge. The hill blocks line of sight. Points are scored for units in terrain features at the end of the turn, totaled at the end of turn 8. 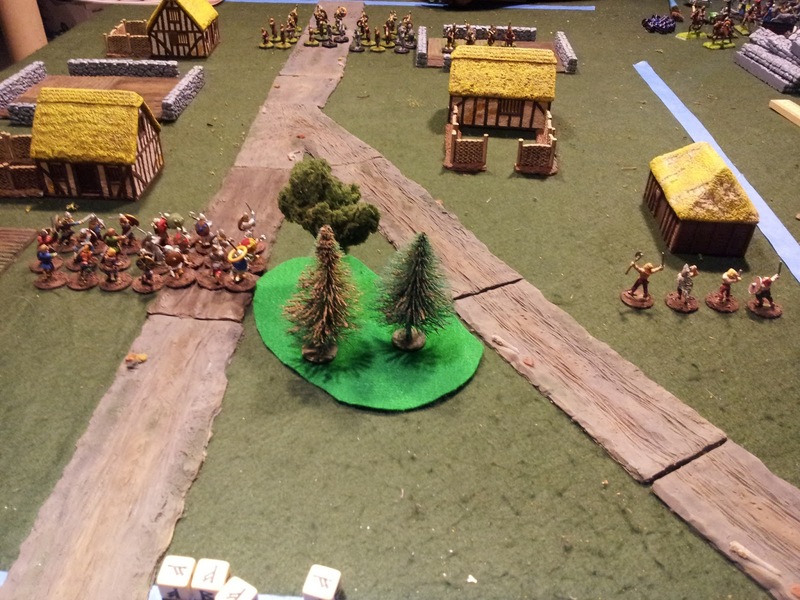 Norman first move, two Sergeants move towards the wood, while Peasants take position to target Hirdmen. Vikings Varangians move twice gaining the hill, using their banner to rest. Hardradda to the base of the hill bringing a unit of Hirdmen. End of turn one, Vikings 12 v Norman 0 points. Normans move one unit of Sergeants into the wood, and reposition their Peasants. 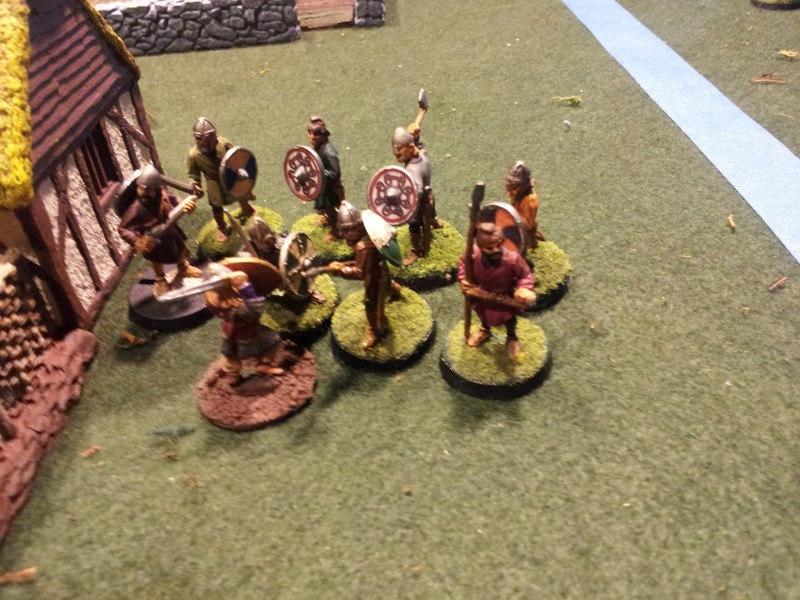 Hardradda turns his Varangians to face the Knights, and moves his Hirdmen to face the weaker Norman forces. End of turn 3, Vikings 68, Normans 12. The Normans position themselves for a coordinated assault . 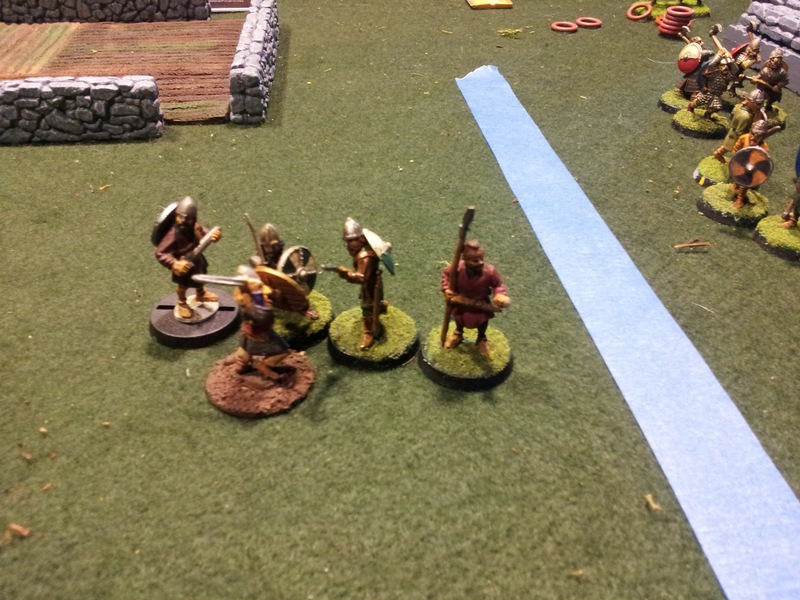 The Warlord moves forward with the crossbowmen. 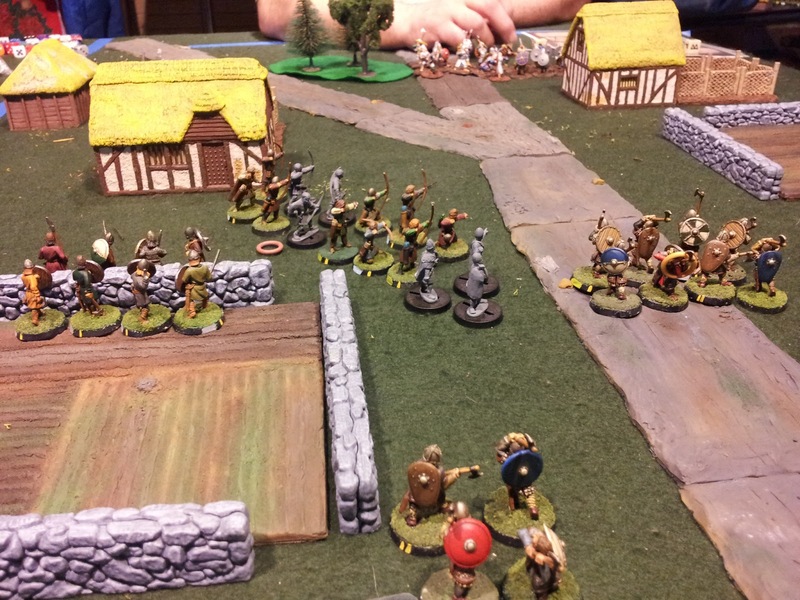 Hardradda positions his warband and braces for the impending assault! End of turn 4, Viking 96, Normans 18. 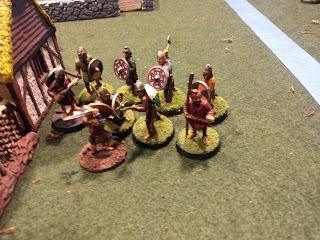 The assault begins with the Norman Sergeants attacking up the hill, The result, 1 Norman, Vikings 0. The Norman Knights charged the Varangians, inflicting 7 kills, but getting destroyed in the process. A huge loss for the Varangians, but more so for the Normans. Sorry, I forgot to take the engagement picture in the excitement. 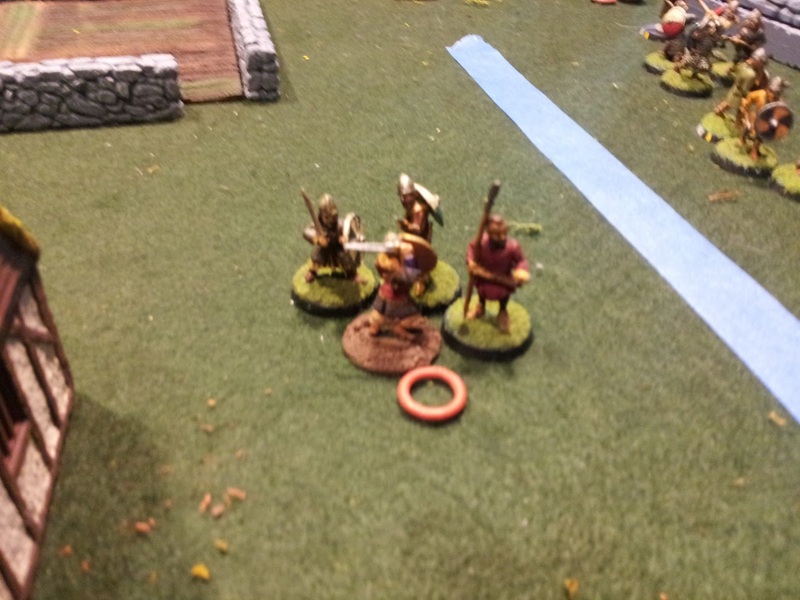 After witnessing the horrific carnage, Hardradda and his Hirdmen rush from the safety of the hilltop, into the crossbowman. They annihilate the Crossbowmen , while only losing one of their own, and turn on the Norman Warlord. 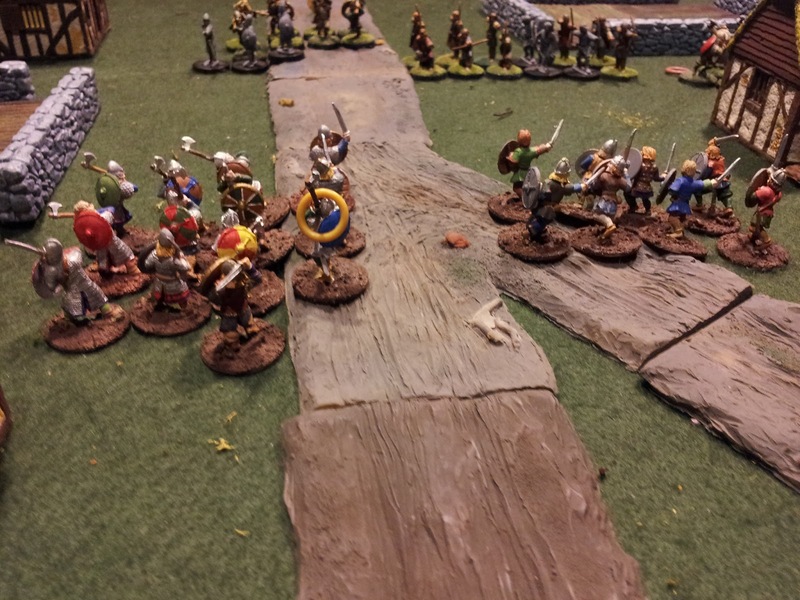 The Vikings lose one more Hirdmen, but bring down the Norman Warlord, Bringing and end to this epic battle. 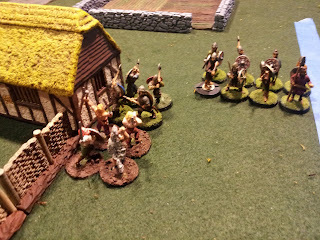 Great tactics by Bernard Harris and his Normans! Vikings are tanks, and must use their SAGA abilities, Ullr, Frigg, and Thor as much as possible, and at the right time. Hardradda and his Varangian Guard are a fearsome force, but not invincible. My SAGA gaming friend Phil Fores, is determined to beat down my Varangian tank. The following is the saga of Phil's attempt to do so with Harold Godwinson, and brothers, along with his AngloDanes. 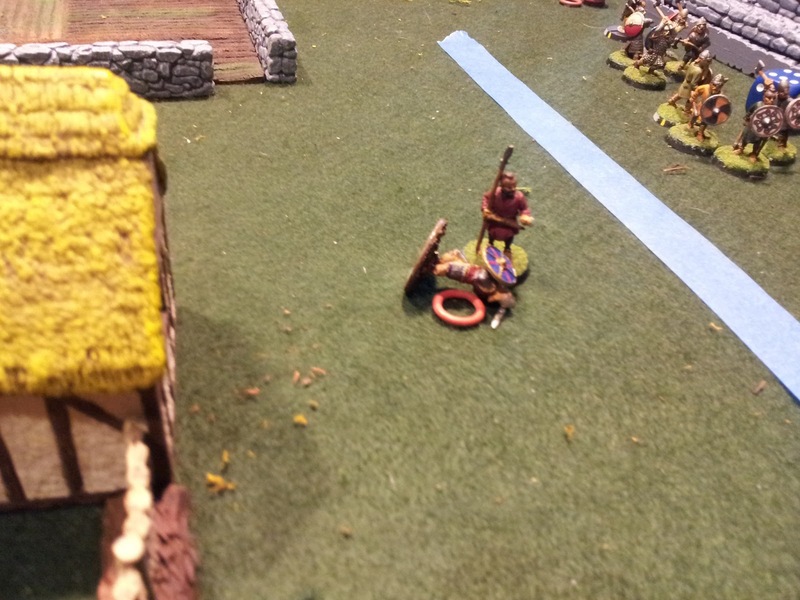 Control of the fork, 5 points along with casualties, or death of the warlord. Hardradda and the Varangians , 12 man unit in the middle, Bezerkers on the right, and a unit of Bondi on the left. Godwinson's and their forces. Ceorls in the field on the left, Godwinsons in the middle, a unit of Huscarls behind them. Bow armed Geburs on the right, a 8 man unit of Huscarl Dane axe unit behind them. The Geburs moved to the left and setup to harass should the Varangians take the fork. The Ceorls moved forward to cross the wall and prepare to guard the Geburs from the impending attack from the Bezerkers. Harald and the Viking warband move forward to take the fork, while Bezerkers move around on the right to attack the flank. With Harald's forces taking the fork, Godwinson pulled his Geburs back, their bow fire not yeiding expected results. Also a unit of Huscarl move forward to reinforce the Ceorls, facing the Bezerkers. Seeing the Ceorls positioning themselves, the Bezerkers determine to charge into them when the Huscarls round the corner of the building. They then charge the Huscarls with cries of Thor, Ullr, and Frigg. The result, both combatants wiped out in glorious carnages, with the Ceorls cheering with dismay and relief. Thinking to attack the Viking from behind the Ceorls rush forward, not expecting to be stopped by one lone Hirdsman warrior. Harald Hardradda rounds the corner of the fence and witnesses the carnage. Seeing the Ceorls rushing forward, Harald charges forward out numbered 8 to1, shouting Thor,Ullr and Frigg. Three Ceorls fall in the first round of melee and a fourth in the second round, and the Ceorls fall back. Harald enraged and bloodied again charges the remainig four Ceorls and slays another, again the Ceorls fall back, leaving the bloodied and worn King cursing them. Sensing, Hardradda is at the end of his strength the Ceorls rush forward to exact their revenge. This was to be Harald's final battle, taking two more Ceorls lives before falling to a grievous strike. Yes, it would have been prudent for the warrior king to have returned to his Varangians and laid claim to certain victory, or wait for his Bondi to join him, but that's not what sagas are written about. A sure path to Valhalla for a mighty warrior, fallen in glorious battle. Both sides had proxie banners, but they were never used. SAGA dice were used for SAGA abilities. When I arrived Phil had his Normans set out and was eager for battle. They were led by the Norman Hero Knight, Ivo Taillefer, on horseback. Taillefere led a formidable force, two units of mounted Knights, two units of foot Sergeants one armed with crossbow, the other with spear, and a unit of Peasants armed with bow. I fielded the AngloDanes led by Harold Godwinson, King of England, and his two brothers, Gyrth and Leofwine, all three wielding Dane Axes. The King had brought 3 units of Huscarls, two sword armed forming one unit of 8, the other with Dane Axes. A unit of Ceorls armed with spear, and a unit of Geburs armed with bow. We placed terrain, I chose a copse of woods close to the ford (represented by a bridge) on my side of the river, Phil chose a plowed field near the other ford on his side. I setup and moved first. Not wishing to become a Norman pin cushion, I set up defensively, with hopes to draw him into a trap. I set my Geburs at the edge of the wood close to the ford, with Harold and his brothers close by. The Dane Axe Huscarls in the middle so as to lend support to either flank. The Ceorls and remaining Huscarls positioned the other ford. Phil placed his Peasant bow in the middle, Taillefer, a unit of Sergeants, and a unit of mounted Knights, poised to oppose my Geburs and Harold. His other unit of mounted Knights and Sergeant crossbow poised at the other ford. I perceived Taillefer’s plan was to weaken me by using Massed Volley, from the Peasants, and cross the ford with a superior force on weakened foe. Harold countered this threat with use of Shieldwall and Intimidation. Knowing Taillefer, eager for battle, was overconfident, Harold prepared his men and waited for the onslaught, and the counter attack he would order. Frustrated by Harold’s tactics, Taillefer forced the issue as the day was ending. He charged his Sergeants across the ford towards my Geburs and Harold. Pushing them forward they fell short of engaging my Geburs and were fatigued doing so. They were followed at a distance by Taillefer. 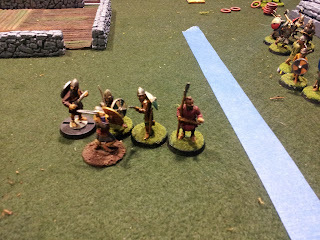 I ordered my Gerbur to fire and caused one casualty, then Harold and his brothers charged at the exhausted Sergeants. Before charging Harold used Trapped, to place a fatigue on three of Taillefer’s units, this put my target of unit of Sergeants into exhaustion, cutting their melee ability in half. The unit of Sergeants were reduced to one very exhausted warrior, 4 fatigues, while my Geburs cheered Harold on. I finished off the lone warrior with Exhaustion, and charged Taillefer. The ensuing melee caused no casualties and the Godwinsons fell back. Taillefer, enraged by the carnage, charged into the Godwinsons, leaving his mounted Knights straining to catch up to support their leader. Here, Ivo Taillefer died a glorious death in a furious battle, taking Leofwine Godwinson with him. Had Taillefer waited for his Knights, for support, he could have survived the combat and defeated the weakened King Harold. Using Heroes adds a lot to the game, they bring unique skills to the battle. Despite all the special skills and SAGA abilities, it all comes down to tactical strategy, and good dice rolls. Mastering your SAGA abilities is crucial! It was a great game and learning experience! My friend, Doug, asked if I could bring over a WW2 game for his son and and his son's scout friends. They had gone to Recruit-Con and gotten bitten by the wargame bug. My WW2 stuff was in a bit of dissaray so asked if WW1 Canvas Eagles would do. I had been working on some rules mods and welcomed the opportunity to give them a run throughly. I decided to keep this event simple and focus on learning the basics, not tracking fuel or ammo. They flew 3 Dr1s vs a single Brisfit, flown by the dad, an experienced CE player. After setting up a little too far apart the boys each picked different approach to their prey. Two were cautious Ryan skirting high on the right flank, Will on the other flank choosing a lower approach. Joe, flying a red tripe, opted for a more direct approach from a slightly higher altitude. Doug knowing the strengths of his Brisfit and weakness of the Dr1, welcomed the attack of these pups. The first casualty was Joe, although getting a stinging hit against the Brisfit, he was taken out by a Pilot Killed result, from a long burst of a single Vickers gun. Ryan and Will gasped and eyed the Bristol wearily. Too late for caution as Doug's Brisfit dove down on Will's lowflying blue triplane. Engine hits were scored and smoke began to steam from Will's engine cowling. Will flew past the Bristol and circled around to attack the Bristol from the rear only to fall victim to a long burst from the rear Lewis gun, causing Will's Blue triplane to explode from a Fuel Tank Hit! But the Bristol was belching smoke from it's engine. Now Ryan became more hesitant, meanwhile the brothers, Joe and Will remounted their tripes and were eager for payback! At one point both the Brisfit and a tripe were spinning side by side from critcal hits, but recovered the next turn. In the end Doug's Brisfit suffered from numerous wing hits and finally a Fuel Tank Explosion, delivered by his son Ryan, who had closed in on the ragged Brisfit. The boys did well for their first taste of miniatures 3D air combat. Canvas Eagles is a bit daunting at first but plays easily after few rounds. The room was a bit dark so picture quality on my iPad suffered. left to right,Doug and son, Ryan, friends, Joe, and his brother Will. Tonight brought another boardgame night at Angela and Donnie Williams home. This time it was Flying Frog Productions, Fortune and Glory, the Cliffhanger Game. The setting for this pulp action adventure set in then1930s. Full of action and adventure, loaded with exotic locations, treasures, mobsters and Nazis. 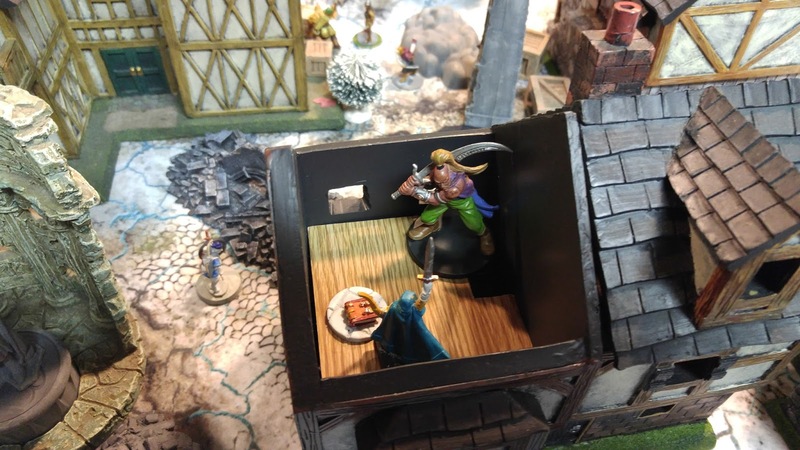 Players take on the roles of uniquely talented adventurers. I felt like I was playing in a Indiana Jones adventure movie. I had bought this game shortly after playing it once at ConnCon. I was impressed enough to shell out the $80 for it. I really like Flying Frog's stuff. Fun games, well constructed, high on replay value. Tonight was a three player game, like my first experience. Donnie had play in an eight play game at Ted Conn's and was more familiar with the rules, so he ran the game. After set up the game ran smoothly, stopping only to clarify a few points with the rulebook.The game was eventful with a lot of unexpected events with players and npcs in the game, Mobsters, Villains , and Nazis seemed to be around every corner to thwart our endeavors. The game is designed to accommodate up to eight players, but plays best with three to five, more if experienced players. We played about fifteen turns in three hours, referencing the rules to be sure we were doing thing correctly. Donnie took the lead at the beginning of the game, with Angela close behind.. It wasn't until the last third of the game that I finally made progress. Angela pulled a coup when a Villain beat her to a artifact, and the Angela snatched from him. I used all my resources to slow her down but in the end it was not enough. Fortune and Glory is a great game. I can heartily recommend it. I was fortune enough to attend Fields of Honor, game con again. I thought I had a great time last year, this time it was even better! Trent Burg, Jeff Hyland and their wives give their all to make this con a success, as well as all the great game masters. 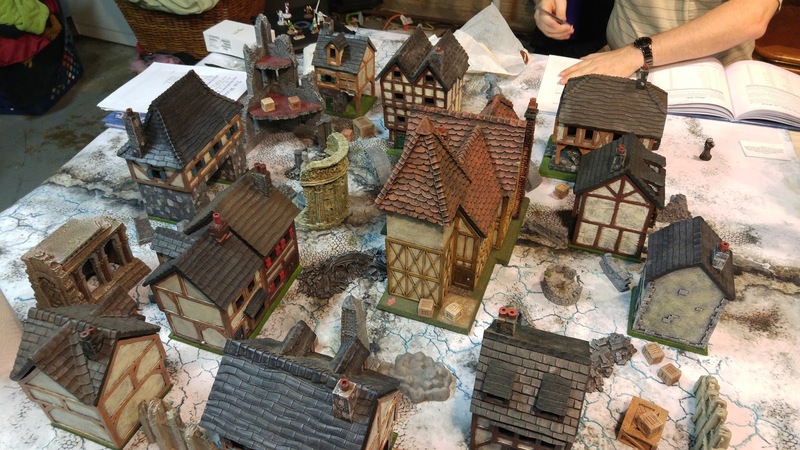 Five full sessions of awesome gaming, with some hard game choices to make! 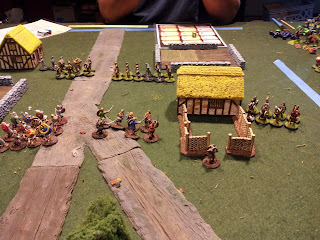 Friday night I participated in Ryan Skow's, 28mm game, Down on the Farm-1970. ZANLA guerrillas attacking a Rhodesian farm under cover of darkness, defended by well armed farmers.There was Rhodesian police force as a relief force that showed up on a random die roll. 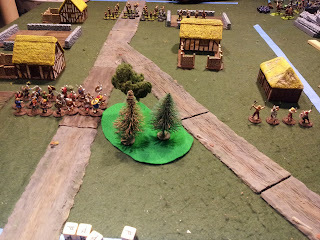 Rules by Ambush Alley Games Force on Force, and supplement Bush Wars. Ryan is a master modeler and worked from photos of the real farm to make this wonderful compound. I played this twice, once as the ZANLA, then as the Rhodesians. Afterwards we sat around and discussed the scenario. Ryan ran this a couple more times Saturday morning, with many people admiring this awesome gameboard. I will post a separate review with more pictures. Saturday morning I played in Trent Burg's Star Wars Starfighter game. Rebel X, Y,and A-wings attacking an Imperial convoy escorted by TIE fighters and interceptors. Rules by Trent and minis were micro machines. I am a big fan of Trent's Warbirds in Miniature WW2 air combat rule, and this rule set is just as good. I flew 2Y wings and followed the X and A wings in the fray. Destroy the freighters and bug out was the mission. My Y-wings running the gauntlet! All Imperial Freighters destroyed, as well as a lot of TIEs . I lost a Y-wing but destroyed a freighter and a TIE interceptor. I was able to fly my two ships and work them together to defend themselves. 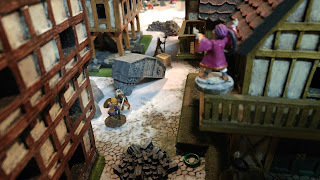 This rule set is great and three dimensional combat blows the two dimensional. You really feel like your dogfighting, you can always add the bells and whistles of the newer game. Great job Trent, I can't wait untill you post the rules on the yahoo group! This game is FUN! 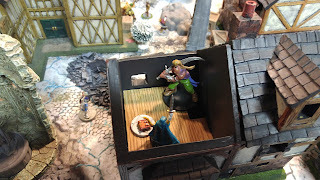 Saturday midday I played in Jeff Guillin's Kings Musketeers skirmish game, One For ALL, One For All!, using his own rules, Ilse de France Swashbuckler miniature rules. I played two of the King's Musketeers aiding in the search for a insolent merchant, who has defied the courts summons. This game was extremely fun and very Hollywood, rules easy to learn. 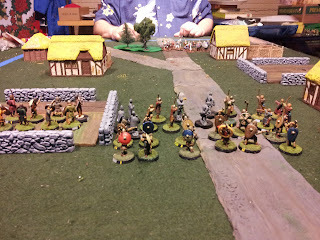 Saturday evening I finally got to experience SAGA Dark Age rules. I've read a lot about them and was anxious to play. 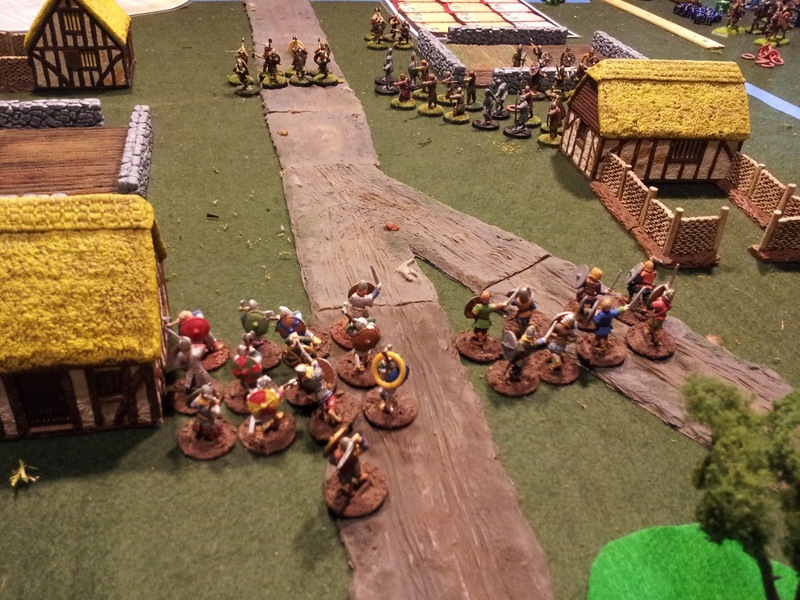 Not your average rules,the battle boards a huge factor in the game. We were in a dark side of the room so the photos aren't great and I was more focused on the game. troops closed. My Beserkers were charged by his cavalry and got too close and were decimated, Fun game I hope to play more of. My thanks to the gamemasters for providing figures and gracious opponent whole helped me learn this interesting games. Sunday, I had signed up to play a wild west Bar Room Brawl, but was lured to play a gorgeous 28mm WW1 trench action game. Rifle Grenadiers to the Forward SAP! 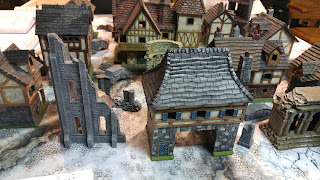 Warhammer Historicals, The Great War rules. 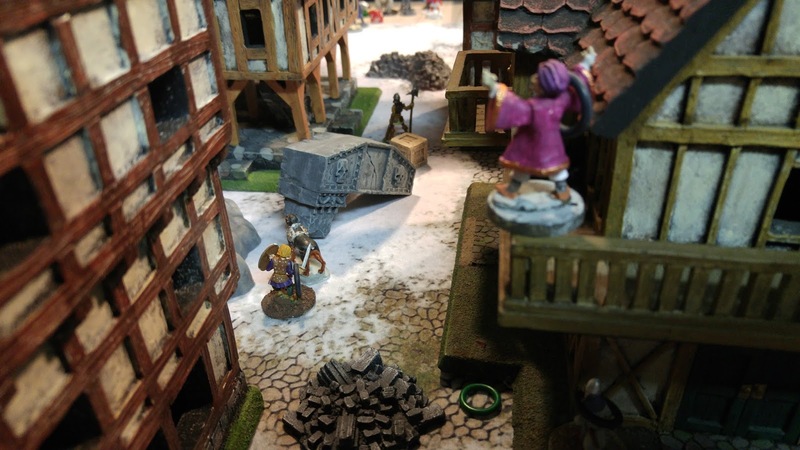 Beautiful figures and awesome terrain provided by Jude Becker. I enjoyed myself immensely and plan to do this also, possibly in 20mm though. I will provide a later post to further detail this game . The will be another post on this Event showing games I did not get to play in as well as more detailed reviews of A couple of games. I'm already looking forward to my next Fields of Honor. A great convention with great people!